At the request of the museum the sculptress Riet Koel-Hemmer has designed two bronze sculptures for the museum shop: a large and a small falcon. 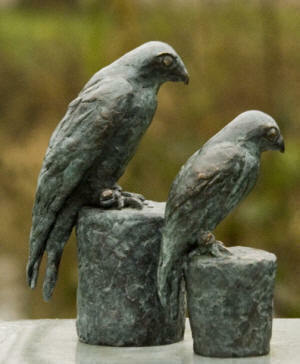 The large bronze falcon is 19 cms high, weighs 1.52 kgs and costs € 165,-. 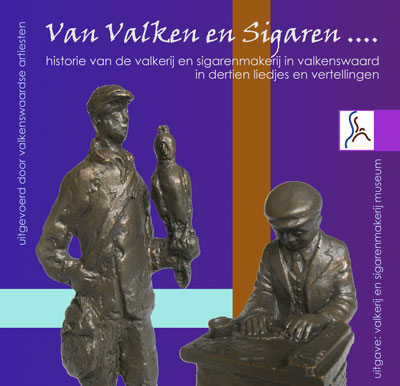 The small bronze falcon is 15 cms,- high, weighs 760 grams and costs € 125,- Postage and package excluded. For more information about the artist, please visit her website www.rietkoel.nl. In the museum shop you can also buy hoods, posters, picture postcards and booklets about falconry and cigar-making. There is also a CD for € 5,-, which was made on the occasion of the 25th anniversary of the museum. The CD contains 13 songs about falconry and cigar-making.